I'm feeling fuzzy headed today. Did someone come into my room in the night and inject cotton wool in through my ears? Did my brain leak out from my nose, pushed out by the fluffy white intruder? Or did I sleepwalk to a fairground and eat so much candy floss that it filled me up from my tootsie toes to the tip-top of my head? Either way, I feel fuzzy headed. My eyes don't feel completely open. I've looked at my reflection in the window and I seem to be the same person I was yesterday. Tired from sleeping too much or not enough, drawn from life taken me by the hands and pulling me every which way at once. But that person isn't me, is it? I don't look like that. I don't look like the life is slowly being sucked out of me as if I have an invisible leech hanging off my back, and every hour is lunch hour. I don't look haunted. But I am, aren't I. I am haunted. I have the cries to keep me company each night. I have the knowledge and the memories. I haunt myself, my own guilt a spectre that follows me, tapping me on the shoulder every so often and shouting 'BOO!' in my ear. I think it and my shadow gang up on me sometimes.. In my head, I look... better. I look healthier for a start. Those bags under my eyes aren't suitcases for the darkness in my soul. There's more volume in my hair. 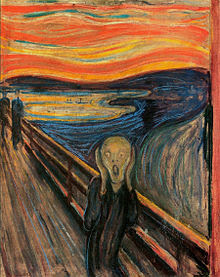 If I put my hands to my cheeks, I could do a passable impersonation of Edvard Munch's The Scream. In my head.... there's more of me. I don't mean I have clones walking around. I'm not bumping into myself or having to share my lunch with... what would be the collective term for a group of Me? A Shiver of Sins? A Sin of Sins, in fact? Either way, I'm not playing host to a Dabble of Doppelgangers. I mean, I am more present. I'm more here. More substantial. So where did I go? Has my body walked off and I'm not actually me but my shadow? Is that why I'm fuzzy headed? Because, in that abyss inside my head, there's only darkness? If so, who turned out the lights? If the bags under my eyes are not suitcases for the darkness within my soul, what good are they? So good to know I'm not the only one who feels that way! I think I should name the bags under my eyes!